Ministers are persons who represent individual sections of the Ministry Departments. Ministerial persons in the function together to form of The Ministerial council between the All Ministers of The World Diamond. Ministerial persons are also responsible for land values, governmental activities and functions of ministries, offices and other sections for logistic and National or International cooperation. 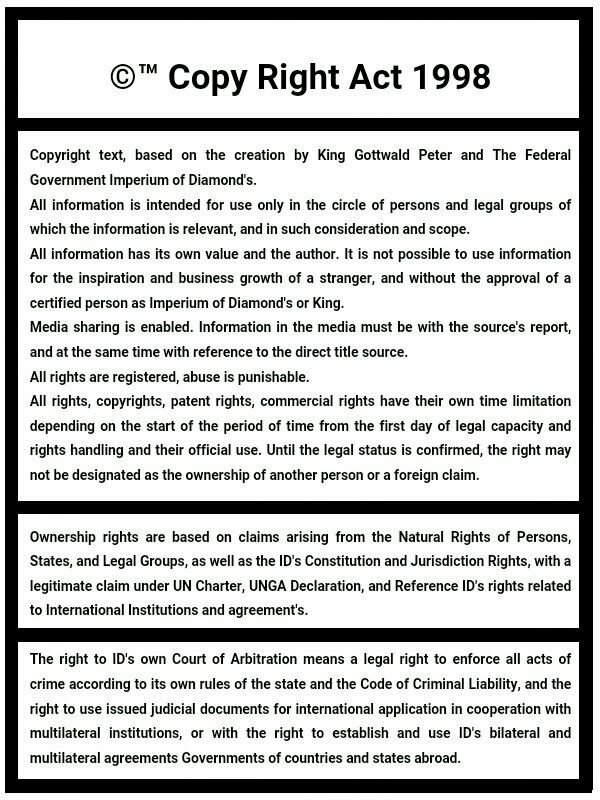 Ministers are representatives of political rights by the Government The World Diamond, another law of the land and the values or the property and rights, nations and system of the International government The World Diamond. They are top people who are responsible for these values and presents it, is their duty to maintain them and ensure their success. Ministers are the main representatives of government The World Diamond, together with the Prime Minister's of the government. The Prime Minister is the person who represents the ministerial persons, the country of the government. The King is entitled to collect the Prime Minister's. Prime Minister's then choose their representatives of the Ministry, the choice between candidates of Parliament, persons in political parties from around The World. Ministers should be elected from among the political parties in The Main chamber of Parliament of The World Diamond. Ministers are elected for Mandate of a period of 2 years. They're replaced by their successors, be the next Mandate of Minister's. The king has the right to appeal to the Minister and the Government or the Prime Minister. Then they must be immediately selected a new successor. The appeal must be considered warranted. Ministers then sit in The International Senate. Ministers at the same time sitting in The Senate Empire of Diamond's, federal government. The Ministers together form the Council of Ministers which is used for global cooperation. Therefore, the Council of Ministers may meet the foreign ministers also because governments to work together to expand the global partnership of governments from around the world. International Ministerial Council. International Ministerial Council may therefore sit in The Mean chamber of Parliament and The International Senate of The World Diamond. The International Council of ministers of the current alliance which creates its own claim for debate before The Senate and Parliament. International Ministerial Council also could not vote in the interests of Parliament and the Senate decision. Ministers can vote only if they is entitled by The Representatives of The Government in The Alliance of common sovereignty The World Diamond. International Ministerial Council sitting together in the interest of international Quality and Logistics to achieve common goals and cooperation. The Council of Ministers therefore once again own the right to sit as an independent department of logistics. International Ministerial Council extends planning systems and arrangements in the interests of international systems and policies. The Ministerial Council therefore supports the extension of international and political systems. Armies and the formation of joint cooperation for the development of global infrastructure, sharing statistics, expansion joint systems, security, evacuation or travel systems, signage, route marking or industry standards, standardization of forms, other forms of international politics. International Ministerial Council meets together for the expansion of cooperation with the Central Bank of The World Diamond. The ministers of countries that support the development of joint trade and economic projects of international financial activity, a common agreement in the banks. The Ministerial Council therefore meets the interests of logistics systems and strategies which support the logistics committee and departments for statistics, planning and development. The Commission cooperates with the Ministry and become part of the ministry. The Ministerial Council has the right to sit in The International Senate, The World Diamond. The Prime Minister sit in The Council of the Prime Minister representatives of countries The Empire of Diamond's why there is full cooperation.